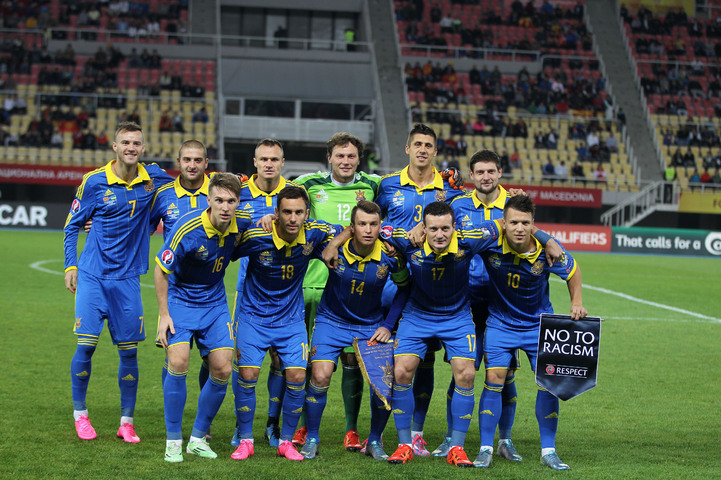 On October 9, the Ukraine national team played a matchday 9 game of the Euro 2016 qualifying round in Skopje. The Ukraine national team coach fielded three Shakhtar players in the starting line-up. Andriy Pyatov was stationed in goal, Yaroslav Rakytskyy played the heart of defence and Vyacheslav Shevchuk at left back. In the first half Ukraine controlled the ball more and attacked more often, but created only few chances. One of them was a Ruslan Rotan shot in the 31st minute following a corner kick, but the ball flew just wide of the goal post. Andriy Pyatov had some work to do in the first half. On 16 minutes, he made a confident save following a free kick shot from Hasani. Ibrahimi’s shot from 22 metres was not a problem for the Pitmen’s goalkeeper either. After the break, Ukraine stepped up their game, and Macedonia started to have problems. On 55 minutes, Rakytskyy fired his trademark long range shot – the goalkeeper made a save. And in the following attacking move the ball hit Leonardo Zute’s hand after a Yarmolenko shot. The referee pointed to the penalty spot. Yevhen Seleznyov converted a spot kick. Having opened the scoring, the visitors continued attacking. On 67 minutes, Shevchuk earned a free kick. After a Konoplyanka cross Yevhen Khacheredi headed the ball in but the linesman flagged for offside. Soon Konoplyanka fired from close range, but failed to beat the goalkeeper. Finally, on 87 minutes, Artyom Kravets skipped past the opponent to bear down on goal and make it 0-2. Thanks to this win, Ukraine got 19 points in Group C to equal on points with Slovakia, who sensationally lost to Belarus. Ukraine will play their nest match on 12 October against Spain.